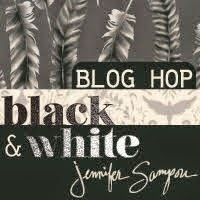 Today I’m delighted to be a stop on the blog hop for Jennifer Sampou’s brand new fabric line, Black & White, for Robert Kaufman fabrics! I met Jennifer at Quilt Market this past fall and just had a blast with her. There may or may not have been an evening of charades in the Hilton bar complete with singing by Amy Gibson and myself. 😉 It might be have been pretty epic. When I wasn’t laughing away after hours, I was on the market floor and able to see Jennifer’s fabrics up close and in person. When she asked me to be part of the blog hop, I thought about tackling a garment for myself with her yarn dies and an accent fabric from her collection. And so, I made the Crepe Dress by Colette. 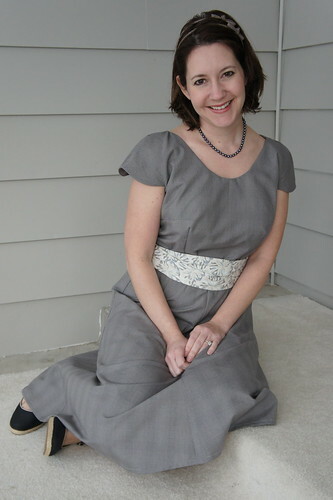 This is a wrap style dress designated by Colette Patterns as “beginner”. Hmm…well probably compared to their other patterns this is a beginner pattern. But I think it is a bit more like an intermediate pattern for your average sewer. The facings are a bit tricky…that’s the main difficulty. Well and the six darts in the bodice… And it requires a good amount of fabric. There’s at least 4 yards of fabric in this dress! I love how flattering a wrap dress is for any body size. I’m not feeling my smallest these days by any means with a post surgery body and this dress helped hide a lot of that. I think you can see the beauty of Jennifer’s fabrics in the photo above. Her Studio Stash yarn die looks really lovely with her fabric from Black and White (with a not so easy to remember name AJS-15017-290 ASH). But if anyone has any suggestions for how the dress should fit me better please feel free to suggest away!! Because I’m certainly loving the wrap skirt! Follow Along with the Entire Blog Hop! Pretty dress! It looks comfortable, too. That's always a priority for me! Thanks for the chance to win some beautiful fabrics. Beautiful dress! I wish I were a more competent clothing maker. I would love one of these. Beautiful dress but you are so pretty how about a red or scarlet bow for a pop of color and some red shoes. Add some bling jewelry. You need to brighten yourself, you are gorgeous. Even a hat would be awesome. Beautiful dress; I think it looks perfect on you! I love the bodice back wrap and the sash. The fabrics make it look even more elegant! Simple and elegant design! Perfect for this fabric! I love this dress. I would make one for myself! Thanks! Casual & dressy at the same time but comfy especially after surgery. I would make a lap quilt out of the fabric bundle and throw in a splash of red. I love the dress and it looks so comfortable. I agree it could be more fitted but no idea how one does that! Probably making a muslin first And adjusting on the muslin… But I think it looks pretty how it is! The belt is great too. Love, love, love the back of your dress! 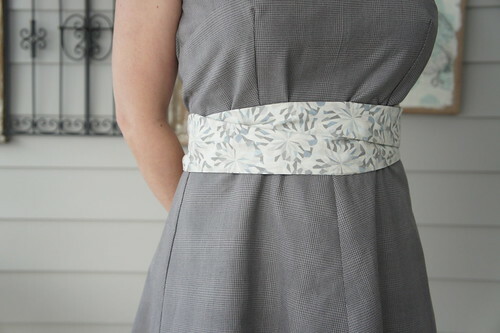 Love the dress, back is stunning, and your fabric choice for belt is fab! You look beautiful! I love the dress! And only wish I could where such a style. It beautiful on you. I could put those black and whites to good use. Thanks! What a cute dress. I love the sash. It looks very comfortable. Very cute! It looks like you feel great wearing it too! The dress is soft and pretty. Looks great on you. Pretty dress, I would love to see it in another color-yes, I do know it's all about black and white😐, wish I knew how to alter, but I think it was supposed to be done to the paparazzi pattern? Wow, I'd have to comment even if there wasn't a giveaway! The dress looks stunning on you! So beautiful. Love your poses – you make a wonderful model. And, I love the bow fabric against the great, just perfect. I'm not a dress kind of gal and seamstress skills are beyond my abilities so I can offer zip for suggestions! I will say that the dress looks comfortable and the sash is lovely, I think it would look more classy without the bow. I love the style but the dress definitely looks like it needs to be taken in a bit in the bodice, both front and back. Other than sizing, it looks great! I really like this dress. I love the sash that goes around the waist. I would never be able to make something like this! I can sew straight lines, but I doubt that I could sew the curved lines required for clothes. I love the dress, and hoping to win the fabrics. Your dress is so pretty. It does look like it could be taken in a little in the back. Love your dress. The belt looks like lace. Simply stunning. I like the dress! But, I am a quilter, sew I won't be making it! Thanks for the giveaway. I DO love the dress.It really looks wonderful on you, but I think it would be better without the bow. Maybe just tie the sash in a knot in back and let the ends hang down because the sash is beautiful.Thank you so much for the giveaway. Black, white and grey are always classic. The dress looks wonderful on you. Enjoy it! That dress is absolutely gorgeous. I'm still making simple skirts and even those aren't quite right yet! Thank you for the inspiration. i love the simplicity of the dress and the contrast tie. The dress can be a backdrop for any color also. I wish I could help you with tailoring advice but I am too new at garment making… the materials really are lovely! And I can see why figuring out how to wrap it may have been confusing, I am still not sure how you did LOL! Extremely pretty and well made dress. Jealous for all sorts of reasons! Love the back details! I also love the giveaway fabrics. You dress is gorgeous! I love the retro look and the elegant drape and color! Very pretty dress and very pretty fabrics. Very pretty. I love the front of the bodice. I do agree, it seems a bit big on the back shoulder. The dress is so flattering and comfy looking. The dress is real cute and you look precious in it ! It looks good and I hope it feels good. It's been ages since I"ve sewn clothes. You make me want to try it. Wraparounds are hard but you did a nice job. I really like the sash and thats a great color. Thanks. Beautiful dress.. Like the sash.. I got started as a garment sewer….quilts don't have darts and they always fit. The gray tones are delicious. Thanks for the chance to win. I love your dress from the front but I'm not so keen on the back! Love the wrap style- and the skirt length is perfect!!! HELLO, it is adorable on you! Thanks for sharing on your neat Blog+in this giveaway as well! Lovely dress. A pop of color in the accessories would complete the elegant design. Beautiful fabrics and lovely dress. It's been too many years since I did garment sewing for me to suggest how to adjust the bodice so it hugs your figure better. Quilting is much easier to get the right fit!! I really like the dress reminds me of the ones mom use to wear back in the 70's I see a lot of the 70's looks coming back……..
You did a great job on the dress! I like the way it wraps in the back. This is a very cute dress pattern. I do think it would benefit from some tailoring for you! Love the dress…..not sure what I would make with the fabric tho…..would have to look around to see something that catches my eye and go from there…..
you are angelic in your Black & White dress. I love how it drapes on you and the back neck line. I'd love to meet Jennifer one day too. I'm a new fan of ALL her fabrics, since the debut of Shimmer last Spring and am finding I can't resist any of her collections the more I uncover, past and present. I don't think that went well, my computer prowls aren't very good. I love the dress, reminds me of spring while we have rain. I like the belt and the draping this dress has. I think you did a great job on the dress. I haven't sewn clothes for years. I used to sew clothes and getting a good fit was always a challenge. Quilts are so much easier! I think the dress looks cute, wear it proudly! The dress looks wonderful, and thanks for the giveaway opportunity! Love the dress, but the belt is not my style, I would be bolder! I like the dress and fabric but suggest the pattern tweaks you mentioned or use of a lightweight stretch to improve fit. Very nice! I love it! It does look a little big but I think it is lovely! Your dress is beautiful, in construction and on you! It does look a little big, but remember that sewing something that doesn't fit just right is no different than wearing something from the racks that doesn't fit quite right, and in my opinion the dress looks much nicer than what you could buy! That said, I do have some dressmaking experience, so here are a few tips that you might be able to do without too much work: 1. First of all, if anything needs to be taken in at the shoulders, do that first before altering anything else, because it will change the fit. 2. Second, try taking in the side seams to reduce some of the excess in the bodice — you could take it in all down the sides to keep the flow (and not allow the hem to sag on the side seams), and you definitely have enough extra width in the waist and hip area even with some taken out. 3. The darts should be 1' below/away from the apex of the bust. That's hard to change after the dress is sewn, but maybe adjusting foundation garments would help. 4. If it seems too baggy to you center front, maybe you could run a little gathering stitch in the middle of the neckline as a "design feature" to take up some of the extra/make it look intentional. 5. It seems like there is too much height in the back of the bodice — I have this problem with every pattern because I have a swayback, so I need to take out fabric. If there is a waist seam joining bodice to skirt, I'd pin out the extra (looks like maybe a good 1.5 inches?) and re-sew the seam. If there isn't a waist seam (it doesn't look like there is), then I would suggest creating one, slashing the back bodice, removing the extra, and then adding a thread loop for the belt to go through so that the tie hides the seam. Cute dress! Love the back. The dress really is a very flattering shape. Thanks for the giveaway. Wow! Sarah has way more expertise than I have with dressmaking. I'll leave it to the experts. Love the black and white fabric – I'm collecting fat quarters at the moment until I have enough to make a lovely quilt. Hope I win! What a nice dress. And it looks really easy to make. I think the dress looks great – I especially like the sash. Pretty dress.! I love the style and fabric you used. Thanks for sharing and for the giveaway. 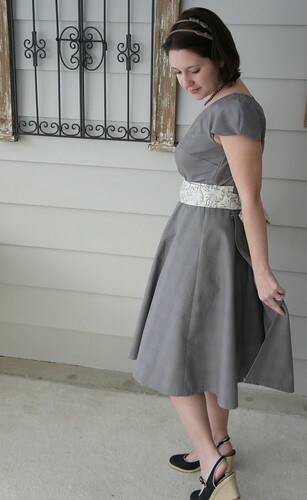 This dress is very elegant in the grey! I think the dress looks nice on you. Beautiful fabric for sure! I love the dress and the criss-cross belt is perfect for it! It would be so cute on little girls too. That reminds me of my mom making "mom and me" dresses when I was little. I was always so proud to look just like my mommy! There are techniques to fitting clothing that we make. There should be plenty of proper fitting tips on the internet. With that said, the dress seems to be a perfect shape for you. That is a lovely dress. Sounds like you had a fun time. I like the sash front and back. I think your dress is so lovely! I think you look wonderful in this dress as is! The bow is the perfect complement – a great statement piece done well! The dress looks wonderful on you! Love the fabrics! That's a very nice dress and you did a wonderful job on it! It looks so good on you! Kudos to you for making a dress! I think I would be too scared. It's lovely! Very cute dress! Thanks for the giveaway! Liked your dress. May be with some alterations, back might look prettier. Thanks for the give away. Looks like a little too much material in the back. Can you take up some of the excess in the middle back seam? Even if not, it looks great on you, and it's a beautiful dress on a beautiful person. The dress is beautiful and you looks sweet and elegant.Great pics! Your dress is beautifully made. The structure of the bodice & the back treatment make this THE BEST wrap dress I've ever seen!!! It's deceptively simple and quite lovely. The wearer will never have to keep fussing with a shifting gap in the bodice! Congratulations. The dress looks lovely on you, a great colour. Sadly I am no seamstress so cannot offer any alteration tips! 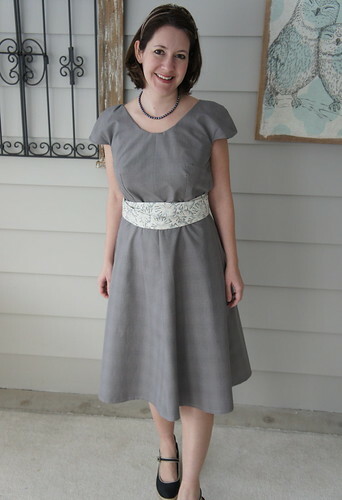 I'm not a garment sewer, but I love the dress, especially the sash (style and fabric). Would love to have some fabric from this collection for a quilt! The dress lovely. It's sweet, pretty, and feminine. The fabrics are flattering and the style is sweet. I've not yet gotten into garment construction [I'm reading tons and taking lots of mental notes] but I'm exciting that it's coming back into fashion to make lovely clothes for our own families again. Very Pretty. The giveaway fabrics are beautiful. What Sarah said above. 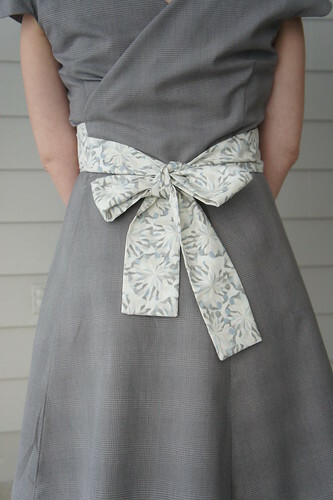 I would also nix the bow and make the belt knotted – more modern looking. Love the materials and once you take it in a bit, will look even better. The dress is lovely and looks adorable on you. I agree it looks a bit loose in the back but I don't have the expertise to assist. It looks like comment 90 from Sarah is very helpful. Like the dress – I haven't made myself a dress since high school! 🙂 you've inspired me! I really like the wrap back if the dress. Great detail! i like the dress. The fabric is simple but beautifil. Nice dress, I admire you for sewing clothes. Clothes are my kryptonite and one day I will learn how to make them properly rather than "making it up as I go along"! The dress is wonderful and the sash is the perfect touch!! the dress is adorable! I'd leave it…. move onto something else fun to make! The dress is lovely, I think you should leave it as it is. Lovely dress, great neutral color, love the black accents. Beautiful job! Thank you for the giveaway. Like the dress……a lot! What a great use of the fabrics. Great fabric and color choices. Dressmaking requires skill and talent, which you have. I love this dress and you look so tiny! It looks a little big in the waist so maybe take it in when your feeling better if you want a more form fitting look. If not, you look darling in this one! Thanks so much! Love the dress! 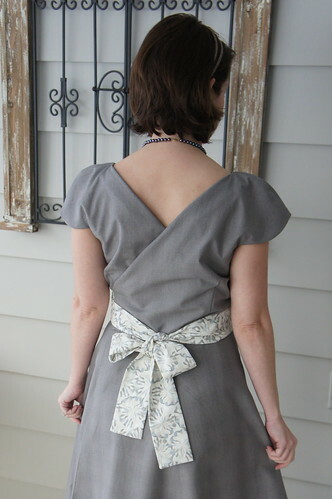 Looks cute with the back wrap, and the different fabric tie. Wow! Six darts in the bodice! Well it looks lovely on you. I'd say it was a win! Beautiful job. Very pretty and classy dress! Great job! I am not a garment sewer, even though I would love to learn someday. I am a quilter, so I don't really have any suggestions on fitting the dress, but good luck and it is very flattering and nice as it is! What a pretty dress! Looks very classic. It's lovely! I think it's possible the back could use less fabric, but it's fine the way it is. Love the bow! Four yards! I've never used that much of one fabric on anything. Thanks for the chance to win. Everyone needs a neutral colored dress! Great sewing job…….. The dress looks great from here! I've no idea about the fitting but my friend has made the same dress I'll ask her to take a look! Cute variation of "the little black dress." Black and white are so versatile, and can be paired with just about anything. Fun fabrics! I love the selection below, it would be exciting to make a quilt from those pieces. Lovely! Very cute dress, especially the sash! That dress is so beautiful! You look amazing in it as well!